The AGF Global Equity Fund is designed for institutional investors seeking global diversification through targeted exposure to growth-oriented companies around the world. The strategy’s objective is long term capital growth. In efforts of meeting this objective, the strategy will focus on investments with an emphasis on attractive valuations, growth/sentiment and risk profiles, A core investment style with a fundamental, bottom up investment approach. Risk management is embedded throughout portfolio management. We believe combined focus on corporate economic profit (EVA) growth and country allocation drives long-term returns while controlling risk. We seek companies that can generate returns in excess of their cost of capital, thereby creating shareholder value. We emphasize countries with attractive value, growth/momentum and risk profiles. Our investment process is based on the concept of Economic Value Added (EVA), which focuses on finding companies that, over time, will exhibit characteristics such as strong/growing cash flow generation, sales, margins and/or asset utilization. Our process is underpinned by fundamental stock selection and aided by our proprietary, bottom-up country allocation framework. The global universe contains 46 countries. Political and liquidity screens eliminate a number of countries. 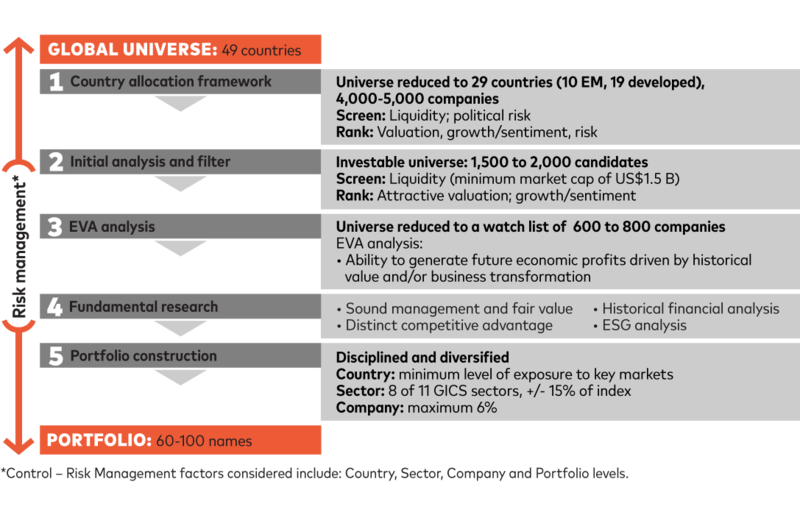 The resulting country universe, representing more than 90% of MSCI All Country World Index by market capitalization, is then scored and ranked for valuations, growth/momentum and risk. A minimum market cap screen of US$1.5 billion is applied in the security screening process. The remaining universe is then ranked based on historical and prospective valuation, growth and momentum characteristics. Companies that are in the top six deciles in this analysis are included in the next screening. Subsequent EVA analysis reduces the universe to the ‘watchlist’. Selected names are reviewed using in-depth fundamental analysis to uncover companies with strong businesses and management, unrecognized growth potential and attractive valuations. The portfolio manager imposes disciplined controls at the country, sector, company and portfolio level. Investing involves risk including loss of principal. Equity securities are volatile and can decline significantly in response to broad market and economic conditions. Investments in global equity may be significantly affected by political or economic conditions and regulatory requirements in a particular country. International markets can involve risks of currency fluctuation, political and economic instability, different accounting standards and foreign taxation. Emerging or frontier markets involve exposure to economic structures that are generally less diverse and mature. The less developed the market, the riskier the security. Such securities may be less liquid and more volatile. Investors should consider the investment objectives, risks, charges and expenses carefully before investing. For a prospectus or summary prospectus with this and other information about the Fund, please call 1-833-AGF-FUND (833-243-3863) or visit our website at www.AGF.com. Read the prospectus or summary prospectus carefully before investing. Stephen Way leads AGF’s global equity team in Toronto, while maintaining portfolio management responsibilities for their global equity and emerging markets mandates. As the architect of the EVA-based (Economic Value Added) investment process used for these industry-leading mandates, he is supported by a team that uses their collective industry experience and globally diversified cultural backgrounds to locate opportunities unrecognized by the market. Stephen is also a member of the AGF Asset Allocation Committee (AAC), which consists of senior portfolio managers who are responsible for various regions and asset classes. The AAC meets regularly to discuss, analyze and assess the macro-economic environment and capital markets in order to determine optimal asset allocation recommendations. Stephen holds a B.A. in Administrative and Commercial Studies from the University of Western Ontario. He is a CFA® charterholder and a member of the Toronto CFA Society. Stephen’s industry experience began when he joined AGF in 1987. In 1991, he established AGF’s wholly owned subsidiary AGF International Advisors Company Limited in Dublin, Ireland and ran the operations as Managing Director until 1994. Registered as a Portfolio Manager under AGF Investments Inc. and AGF Investment America Inc. CFA® and Chartered Financial Analyst® are registered trademarks owned by CFA Institute.